(Left to Right) Maggie Grace as Allison McNeeley, Ryan Kwanten as Matt Wheeler, Brooks Braselman as Brock Hutchinson, Russell Peters as Keith Mahar. The popularity and demand of comic book conventions over the years has led to a boon of them rapidly popping up and spreading like wild fire around the country. The term “Con” is the abbreviation for a type of convention, whereas that annual event hosts an enormous number of attendees, a variety of booths and panels, with many fans dressed up in costumes of their favorite characters, in other words termed cosplay. The major Cons are becoming so widespread, that they are splitting off into subcultures such as comic books, cartoons, video games, anime, superheroes, pop culture, and entertainment. 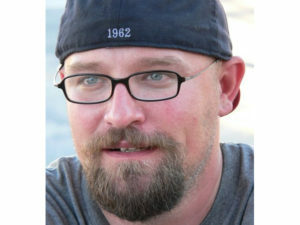 Writer/director Zak Knutson (Marvel’s Captain America: 75 Heroic Years) is mostly known for his direct involvement on several Kevin Smith projects. Supercon explores the innerworkings of the Con community. The root of the film is not based on the mega Cons such as the San Diego Comic-Con, but rather on a series of mid-tier conventions in Florida, called Supercon. These mid-range conventions take place every weekend in various parts of the nation. The premise was conceptualized as Knutson heard about an incident that occurred at Dragon Con in Atlanta, with four guys disguised as stormtroopers, who raided the convention and absconded with over $100,000. The masked men slyly escaped through this annual cosplay parade, as they easily blended in with 500 other stormtroopers. The director became fascinated with the notion of this ingenious heist idea, because it had never been done before. Or at least no one had been caught before now. The movie follows a dubious group of D-list entertainers, including former child actor, Keith Mahar (played by Russell Peters), cartoon voice-over actor, Matt Wheeler (Ryan Kwanten), comic book artist, Allison McNeeley (Maggie Grace), 1980s TV star, Brock Hutchinson (Brooks Braselman), and comic book creator, Sid Newberry (John Malkovich). Their main commonality is that their only source of income is from working these conventions. Clancy Brown as Adam King. Photo Credit: Patti Perret. 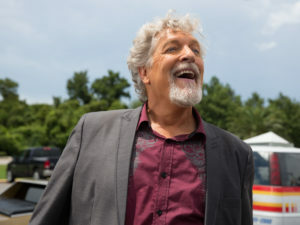 Their presence as a whole is diminished when the main attraction, the self-absorbed television star, Adam King (Clancy Brown) sabotages the squad’s reputation and has them banned from the convention, with the help of the money hungry promoter. This thrusts the disparate bunch into panic mode, as they start to plan a larger-than-life heist against the convention organizer and egotistical television icon. To produce a convention believably, it takes ample resources in attempting to replicate all the costumes and cosplayers. “If you’re going to do a cosplay movie, working in New Orleans is going to help you more than you ever thought. Everybody down there has got a costume. And not just one costume, they have four costumes, because of Mardi Gras. When you suddenly put out a casting call for cosplayers there, it’s like asking people in California to show up in shorts and flip flops. The other great thing is that the cosplay community down there is so involved that they all know each other,” marveled the filmmaker. In theatres, VOD, and Digital HD now. Available on DVD June 5th.